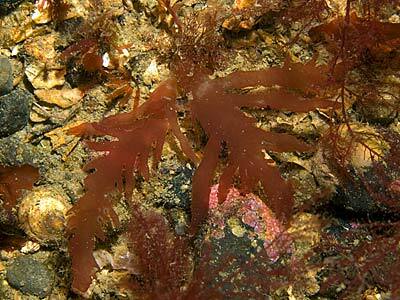 Description: Thallus flattened but fleshy and gelatinous. Divided into blades to 8 cms long and 6 cms wide with flattened branches growing from the margins as pinnate parallel-sided proliferations. Mucilaginous. 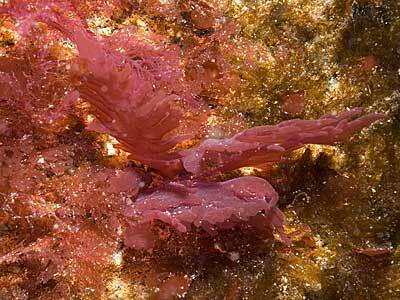 Habitat: Rare, only sublittoral to 18 m on mobile substrates such as gravel and stones. Often in tide-swept areas or considerable wave exposure. Distribution: Generally western in the British Isles. from Ireland, Wales western Scotland and south-western England. Europe: Sweden. Morton, O. & Picton, B.E. (2016). Schmitzia hiscockiana Maggs et Guiry. [In] Encyclopedia of Marine Life of Britain and Ireland.